The 6th house rules your health, routine, work environment, and pets. The health ailments you're most prone to and the way you approach your health are found by the sign on the cusp and planets within the house. Your everyday habits are also ruled by this house, how you manage day-to-day tasks. The 6th house governs the kind of work environment you are most comfortable in, giving a clue as to what professions you'll enjoy. The 6th house is a house of service, in this case, work. Your pets show up here as well (and whether you're a pet person at all). The 6th house is ruled by Virgo and Mercury and is a cadent house. You throw yourself into your work, and are hard-working and dedicated. You’re driven to work in life, and try to do the absolute best you can. You can have a hard time with coworkers because you expect them to work as hard as you do. You need physical exercise to stay healthy. You may need to work for yourself with Aries here, or do work where you’re mostly on your own. You can work in the military or in sports. You focus on your work goals and work at them slowly but surely. Everyone else might think you take too long, but you get there eventually, and you do a good job. If you’re not happy with your work, you can be lazy and come up with excuses. You can be prone to problems with your throat or weight. You can work as a teacher with Taurus here, or do work that engages your senses. You can also work in finance. You need work that keeps you interested because you get bored quickly, so you may go from one job to the next quickly. It could be good for you to do work that requires you to use your mind in some way. Your nerves can impact your health, and you need to work on calming yourself. You may work two jobs throughout your life with Gemini here, steadily or for periods of time. You can work as a writer, speaker, or with young people. You work well when you’re helping other people, and can be emotional with your work. You may care more about your work than any other area of your life. If you don’t have stable work, it has a physical impact on you. Watch for stomach or breast issues. You’re caring with your coworkers, and not dominating as a boss. You can work from home with Cancer here, or do work that helps families or with your own family. You take pride in the work that you do, and need praise for what you complete. You can dedicate yourself fully to your work, and want to be in the spotlight. When work isn’t going well, you feel lethargic and unhealthy. You can be prone to heart or back problems. You can work in the theater or film with Leo here, be in the public eye yourself, or do work that helps people in some way. You’re focused on the details in your work, and can get so lost in them that you never actually finish the job. You prefer work that’s practical and uses your mind. Your health is of great concern to you, and you pay close attention to what you eat and drink, and how much you exercise. When stressed, it manifests physically, and you can have stomach issues. You can work with animals or do something in health care with Virgo here. You can be the mediator at work, the one coming up with compromises and getting coworkers to play fair. You work well with others, and do best with a partner. You need harmony in your work environment, and without it, you become very ill. Balance is important for your health in general. With Libra here, you can work in the arts or beauty industry, or with the law. You’re serious about your work, and can become obsessed with it at times. You may be too intense for coworkers to deal with, and can work best on your own. When you’re emotionally and mentally drained, it leads to health problems for you. You can have issues with your reproductive health. With Scorpio here, you can do work in science, research, or in finance. You’re a fun coworker, someone who tries to make people laugh and enjoy their work, but you may not take your work very seriously at all if you don’t care for it. On the flipside, you can work yourself ragged if you love your work, and need to not overdo it. You can have problems with weight, overeating, or drinking. With Sagittarius here, you can do work that involves travel, writing, or teaching. You have great self-discipline with work, but you need to make sure the work that you’re doing is fulfilling, or you just waste your time. You prefer to stay in a job for a long time, not wanting instability with work. You can either be a workaholic, or avoid work entirely. You try to be responsible with your health, and can have issues with your skin, bones, nails, and teeth. With Capricorn here, you can work in politics, government, or as an entrepreneur. You need work that’s unusual, innovative, or forward-thinking, or a work environment that’s different in some way. Without that, you get bored. You do well working in groups, and become friends with coworkers. Your nerves can cause all sorts of health problems for you, and you need to learn to corral your wild energy. With Aquarius here, you can work in science, technology, or invention. Your emotions are directly tied to your work, and if you’re doing work that’s fulfilling, you feel great. If you’re not, it has an impact on your physical health. You can do well as an employee rather than a boss, but need to make sure you don’t get taken advantage of. You worry too much about your work. Watch for health issues with your nervous system, toxicity, or your feet. With Pisces here, you can do work that helps others, or work with spirituality or the metaphysical. With your natal Venus in your 6th house, you like to do things for your loved ones. You want to always be there for them, and that’s how you show your love for them. You’re not much for regular romance, and prefer to pay attention to the little things. You may think you deserve the kind of love that would be best for you, sacrificing love to be more practical. The 6th house rules work, and you can do work in the arts, the beauty industry, in design, or in human resources. You need a work environment that’s peaceful and balanced to do your best work, otherwise you’ll be unsatisfied. With your natal Mars in your 6th house, you’re an exceptionally hard-worker. You funnel your energy into the work that you do, and have plenty of energy for plenty of projects. You can take on too much at times though, and run yourself down. You like to get things done quickly and efficiently, and don’t put anything off. You’re good with structure and order, likely quite organized, and have a perfectionist inside of you. You may have a hard time working with other people, always butting heads with coworkers. Since the 6th house rules your work, you could work on your own, in sports or physical fitness, in the military, or in the entertainment industry. 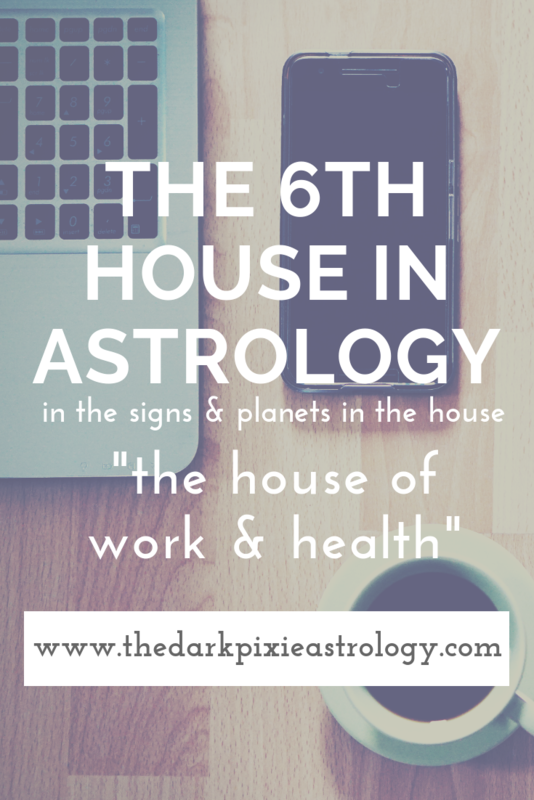 With your natal Jupiter in your 6th house, you can have an easier time than most finding work when you need to. You just need to make sure you remain interested in whatever you do so you don’t bounce around from job to job. You tend to get along well with your coworkers, or work with people from other places, and you expect nothing but the best out of them. You can understand the details and how they fit together. The 6th house rules work, so Jupiter here can show that you can work with writing, speaking, travel, language, dealing with other cultures, the law, or teaching. With your natal Pluto in your 6th house, you put all of your energy into your work, and can become obsessed with it. You’re excellent at problem-solving, and prefer to work on your own. When it comes to health, you can be focused on having a healthy lifestyle, and open to alternative methods. Since the 6th house rules work, any planet here can show work you may do in life, so with Pluto here, you can work in research, science, the occult, hidden things, transformations, using other people’s money, forensics, or psychology. With transit Mercury in your 6th house, your mind is focused on work. You can deal with work projects and tasks much more easily, and you’re more productive and efficient. If you’re a writer or work in communications or with technology, this is a good period for you. You may have more conversations with coworkers or about your work, or deal with technology more than usual. Your work environment is busier. You could also make plans to improve your health, get medical advice, or talk with your doctor. If you make health changes, make sure they’re small changes, and if they’re big, implement them a little at a time. You’re more logical and analytical.